AKA: Veiculo Lancador de Satelites. Status: Active. Payload: 380 kg (830 lb). Thrust: 1,048.90 kN (235,802 lbf). Gross mass: 49,609 kg (109,369 lb). Height: 19.50 m (63.90 ft). Diameter: 1.00 m (3.20 ft). Apogee: 200 km (120 mi). LEO Payload: 380 kg (830 lb) to a 200 km orbit at 5.00 degrees. Payload: 80 kg (176 lb) to a 800 km SSO. Development Cost $: 300.000 million in 1999 dollars. Flyaway Unit Cost 1985$: 8.000 million in 1990 dollars. Stage 0. 4 x VLS-0. Gross Mass: 8,550 kg (18,840 lb). Empty Mass: 1,328 kg (2,927 lb). Thrust (vac): 303.000 kN (68,117 lbf). Isp: 260 sec. Burn time: 59 sec. Isp(sl): 225 sec. Diameter: 1.00 m (3.20 ft). Span: 1.00 m (3.20 ft). Length: 9.00 m (29.50 ft). Propellants: Solid. No Engines: 1. Engine: S-43. Other designations: Veiculo Lancador de Satelites. Status: In production. Stage 1. 1 x VLS-1. Gross Mass: 8,720 kg (19,220 lb). Empty Mass: 1,536 kg (3,386 lb). Thrust (vac): 320.600 kN (72,074 lbf). Isp: 277 sec. Burn time: 58 sec. Isp(sl): 170 sec. Diameter: 1.00 m (3.20 ft). Span: 1.00 m (3.20 ft). Length: 8.10 m (26.50 ft). Propellants: Solid. No Engines: 1. Engine: S-43TM. Other designations: Veiculo Lancador de Satelites. Status: In production. Stage 2. 1 x VLS-2. Gross Mass: 5,664 kg (12,486 lb). Empty Mass: 1,212 kg (2,672 lb). Thrust (vac): 208.390 kN (46,848 lbf). Isp: 275 sec. Burn time: 56 sec. Isp(sl): 204 sec. Diameter: 1.00 m (3.20 ft). Span: 1.00 m (3.20 ft). Length: 5.80 m (19.00 ft). Propellants: Solid. No Engines: 1. Engine: S-40TM. Other designations: Veiculo Lancador de Satelites. Status: In production. Stage 3. 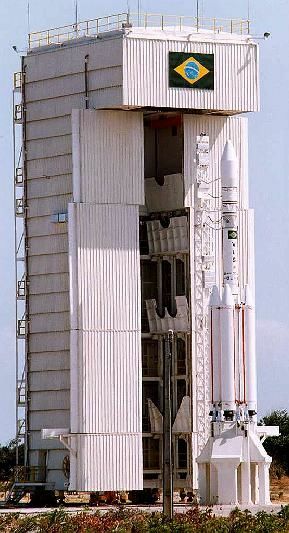 1 x VLS-3. Gross Mass: 1,025 kg (2,259 lb). Empty Mass: 190 kg (410 lb). Thrust (vac): 33.240 kN (7,473 lbf). Isp: 282 sec. Burn time: 68 sec. Diameter: 1.00 m (3.20 ft). Span: 1.00 m (3.20 ft). Length: 1.80 m (5.90 ft). Propellants: Solid. No Engines: 1. Engine: S-44. Other designations: Veiculo Lancador de Satelites. Status: In production. Family: all-solid, orbital launch vehicle. Country: Brazil. Spacecraft: SCD, SACI, SATEC, Unosat. Stages: S-43, S-44, S-40TM, S-43TM. Agency: INPE. Bibliography: 2, 4, 42, 455, 552, 554, 61.